This beautiful Russian Charoite makes quite a statement with its pretty purples and greys running through it. 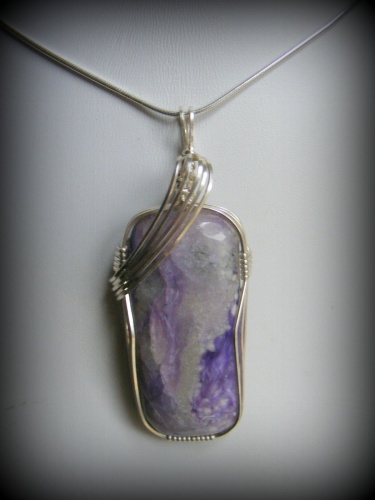 Charoite is said to enhance self-esteem, accelerate spiritual growth, and improve the ability to love. Piece is styled with a sterling silver frane and a swoop going across the top of the piece. Measures 2" long from top of bail to bottom of gemstone and 3/4" across. Comes with a sterling silver snake chain.